Rudbeckia fulgida, with Hemerocallis fulva (also called “ditch lilies”) in the background. You’ve heard the buzz words: “Green gardening”, “Sustainable gardening”, “Environmentally sound gardening”. But you don’t know how to transform your water-guzzling, fertilizer-gobbling, time- and energy-intensive outdoor space into something that requires less of all those things. I’ll be honest here. Much as I’m always encouraging my readers to DIY, and giving (I think) good advice and how-to’s, in this case I’d recommend you hire a professional. If you’re willing to put in hours/days/weeks of labour, and/or amortize the project over a few years, you can definitely do it yourself, and save a lot of money in the process. You may have read some of my articles and started to implement elements (get ready for an evening of reading!). But if you’ve already unsuccessfully had a go, or achieved a product that doesn’t quite satisfy, or know that you haven’t the time energy or expertise to get what you want, then it’s time to call in the cavalry. Probably the chief mandate of sustainable gardening is the same as the mandate of the medical profession: “Do no harm.” When we use a lot of inorganic additives most of it is washed either into watersheds or municipal sewage systems, resulting in algae blooms and fish death, and may result in inappropriate vegetative growth on your plants instead of flowering or fruiting growth. When we try to grow plants that need conditions that differ substantially from your own environment, you’ll find you either have to water (with fresh water) through dry months, or lose plants that prefer warm, dry conditions instead of our cold wet Fall/Winter/Springs (which leads to the whole conversation about wastage…). You’ll think the answer then is easy–native plants. But have you noticed, your property isn’t “native”. It’s been developed and re-developed possibly many times since the days when it was a forest or prairie. Your soil is different, the sun and wind exposure is different, the fauna is very different. 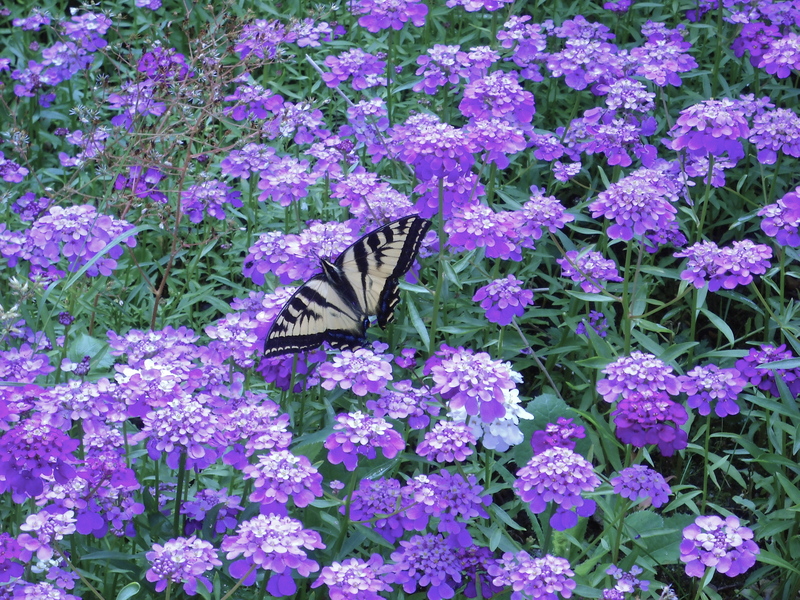 Iberis umbellata, or annual candytuft, with butterfly of unknown origin. Candytuft self-seeds like crazy in my garden (and my neighbours’ gardens!). So if you’re longing for that beautiful and sustainable outdoor retreat, consider calling in a designer that specializes in this. Check out their credentials and portfolio, call their references–you know all this, you’d do the same for a plumber or roofer. And then enjoy the results, knowing that your days of harming the environment through your gardening practices are at an end. 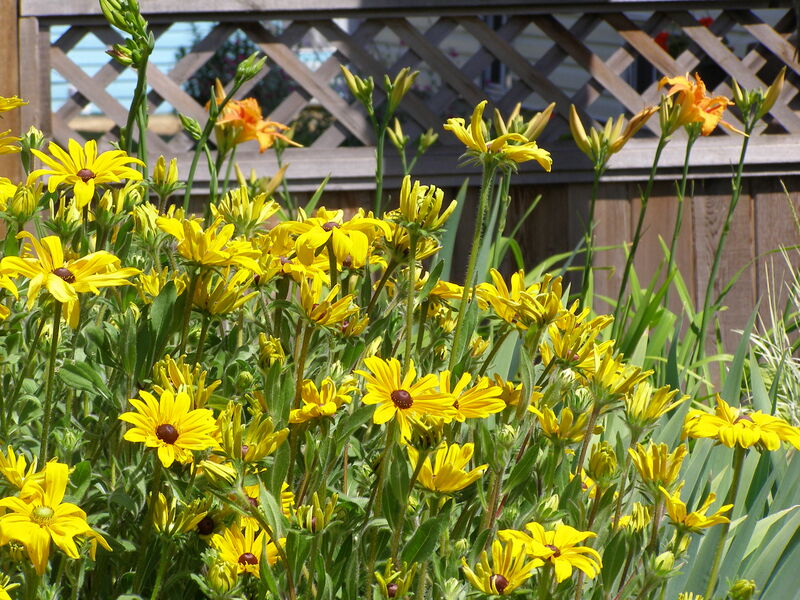 This entry was posted in design, garden, Sustainability and tagged environmentally sound gardening, green gardening, hemerocallis fulva, iberis umbellata, native plants, Rudbeckia fulgida, sustainable gardening by Janet. Bookmark the permalink.